This is the best Banana Bread recipe that is buttery, soft, and super delicious. 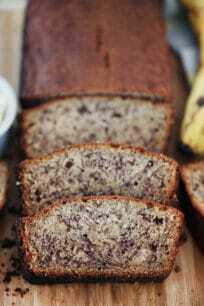 It requires a few ripe bananas to get the PERFECT texture and a homemade look to it. Preheat oven to 350°F. Lightly grease a loaf pan with butter and line with parchment (baking) paper. Set aside. In a large bowl mash the bananas well using a fork. Next, add the melted butter, stir to combine and add the egg, vanilla and sour cream to it. Whisk until fully combined. Add the flour, baking soda, and salt. Using a spatula, stir until fully combined. Pour the batter into prepared pan and put in the oven. Bake for 40-50 minutes, or until bread is golden brown and a toothpick inserted in the center comes out clean. Let cool in the pan for 15 minutes, after which remove from pan and allow to cool completely onto a wire rack.